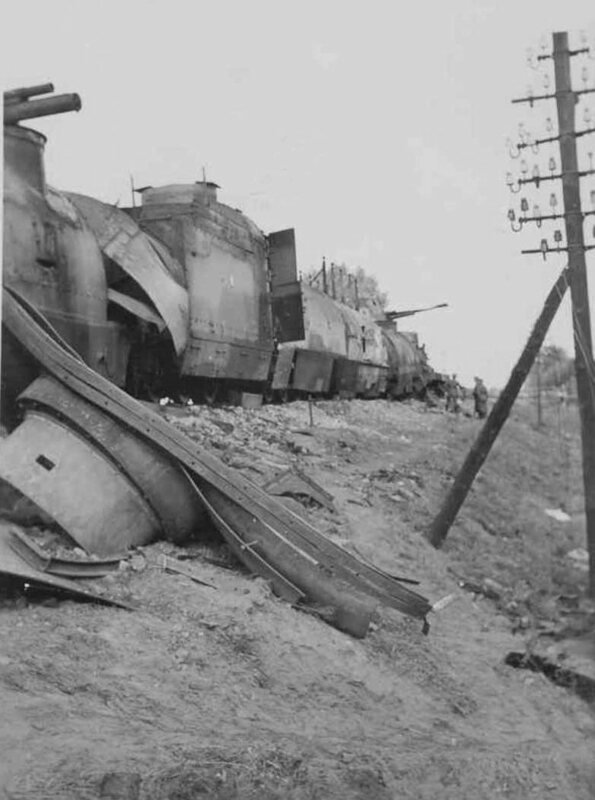 The page contains a walkaround gallery of Polish World War II armoured train Nr.12 (former "Poznańczyk"), abandoned and destroyed by the crew on 9 September 1939 in Płochocin village[Wikipedia], due to cutting off its withdrawal route to Warsaw by German troops in Ołtarzew. 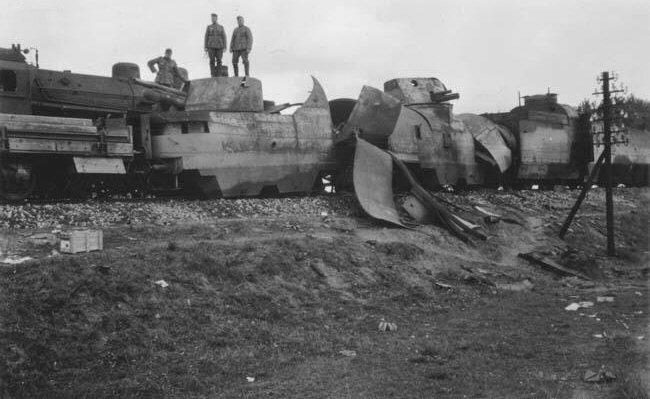 The armoured train, much more powerful, than its German half-improvised counterparts of that time, and blown-up in spectacular way, became a subject of numerous photographs taken by German soldiers. 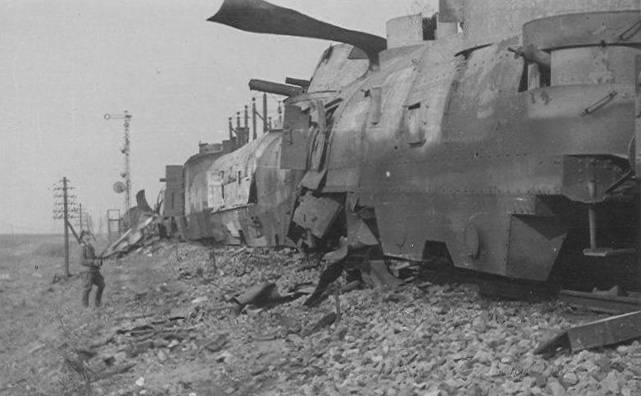 Judging from a number of photos, that keep being revealed in the Internet from private collections, it surely was one of most often photographed armoured trains ever – there might be risked a thesis, that it was the second most photographed one, after another Polish armoured train Nr. 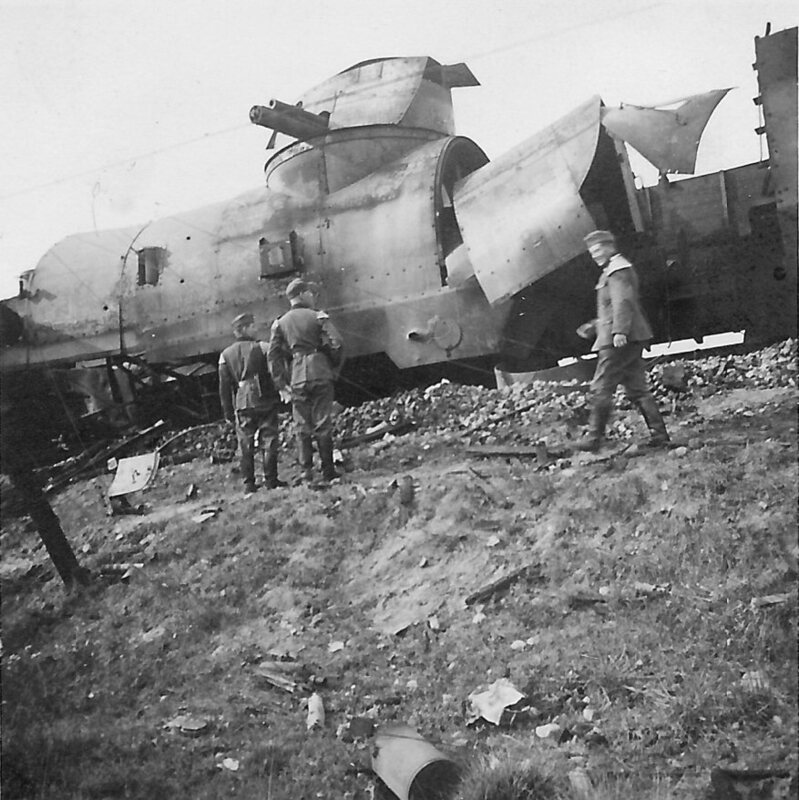 13 ("Generał Sosnkowski"), bombed next day at Łochów station. 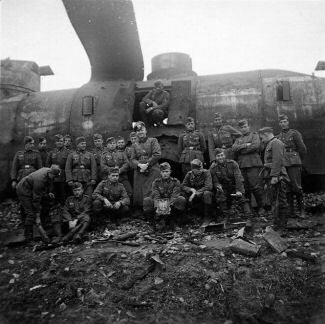 The photos come from different sources, and were mostly taken by anonymous German soldiers. They are published in educational and research purpose, arranged in order and annotated by us. A quality of many photographs is not best, but they all give valuable insight. Most of photos can be enlarged. We are looking for new photos, or better scans of exisitng ones - contributors will be credited. During an update on 20. 02. 2019 we located an exact place and corrected train's move direction and orientation. 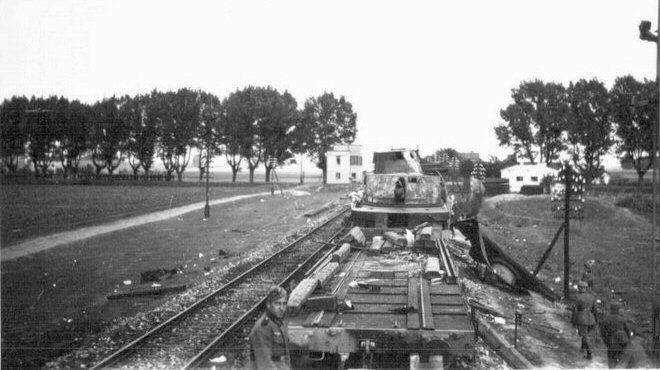 General views from right side of the armoured train Nr.12. 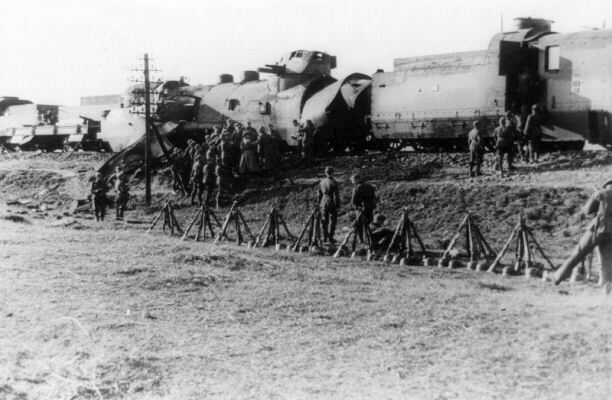 The locomotive was often driving tender ahead in combat alert, so that commander's post was forward, but in this case move direction was to the right, towards Warsaw, and the locomotive was driving forward. 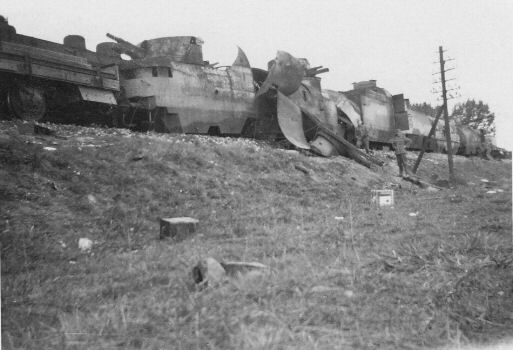 The armoured train, on closer track, consisted of – from the right: combat flatcar, artillery wagon, assault (infantry) wagon, armoured locomotive Ti3-16 with a tender and commander's turret, second artillery wagon and second combat flatcar. 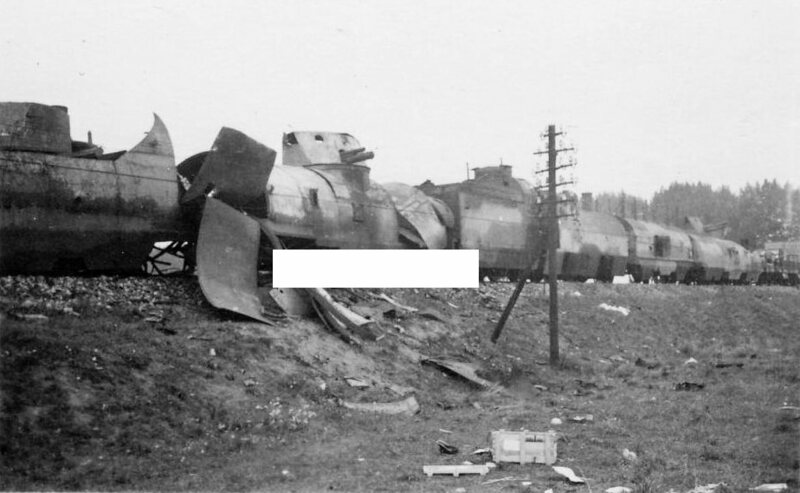 After the train there are armoured draisines, hardly visible on the left, under a signal. 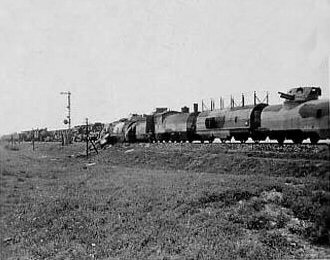 On farther track there are ordinary locomotives with wagons, including two open freight wagons to the right. Click to see wider scene. 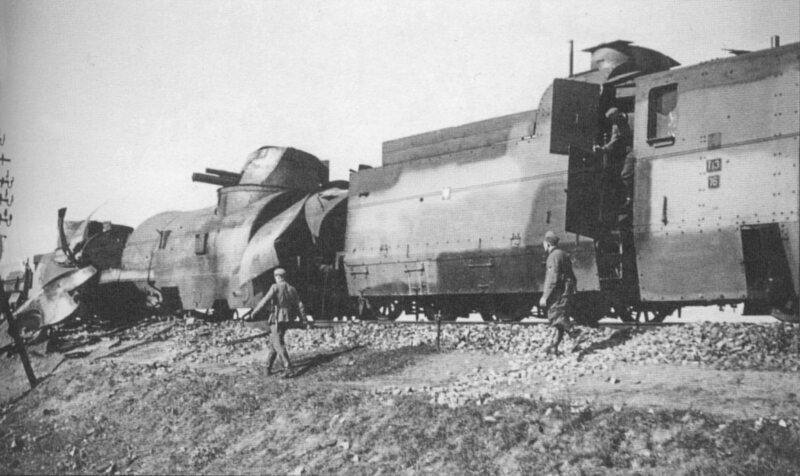 Longer perspective view – on the left there is possibly an auxiliary part of the armoured train (in spite of two locomotives in front of it). 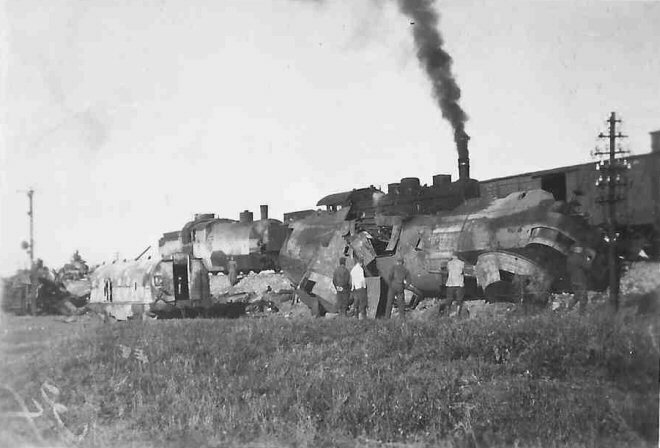 Photos of the train's right side, from the front. Move direction to the right. 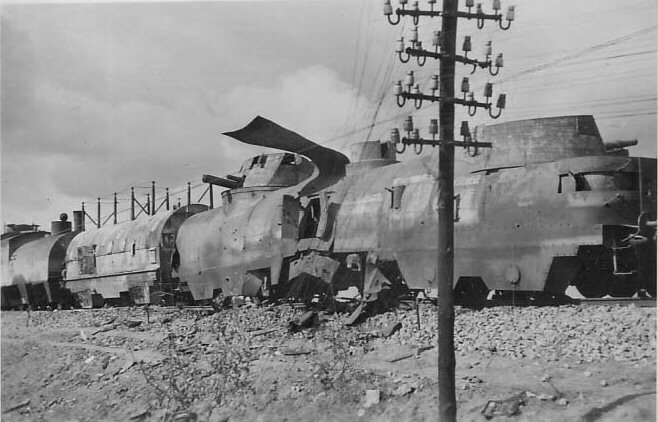 In a foreground we see details of the combat flatcar, protecting the train against mines and used to carry tools and materials for track repairing (there are rails and sleepers visible). 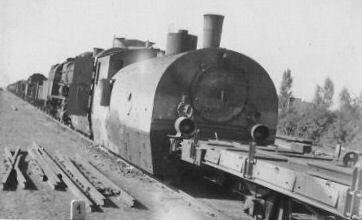 The train Nr.12 had both flatcars specially modified, with three toolboxes and 22 additional lockers for small materials (visible here). There is bent out armour belt on wagon's roof. 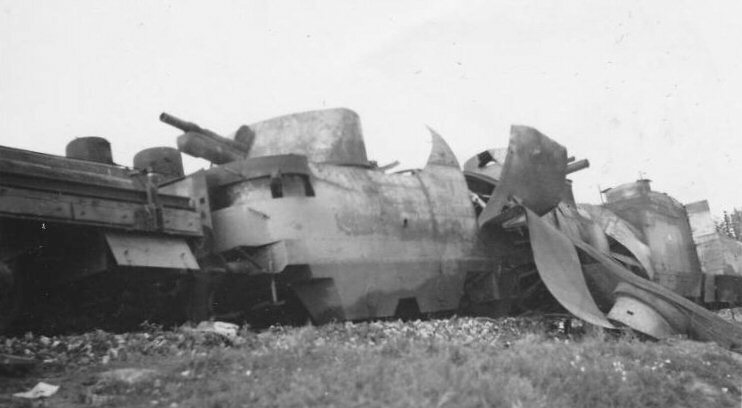 A 100 mm howitzer turret has open side hatch. A close up. There are 7.92 mm wz. 08 (Maxim) machine guns in corner casemate and side drum mounting. 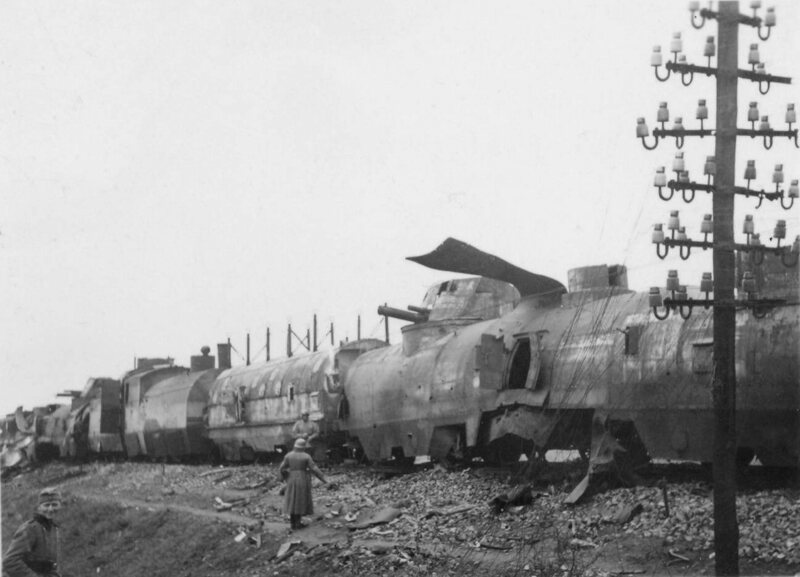 These wagons had eight machine guns in walls and one in anti-aircraft turret. There are two bullet holes visible above a bogie, and fire marks. An effect of internal explosion draws an attention – bulged wall near side entrance, and thorn armour belt, bent over from opposite side. 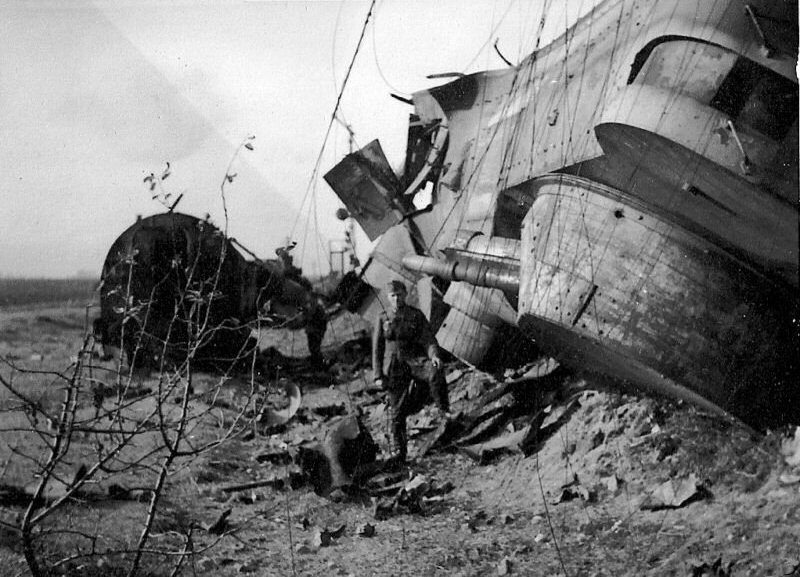 Well visible is longe-range radio antenna upon the assault wagon. A close up of leading wagon. Both drum machine gun mountings are turned towards a camera. 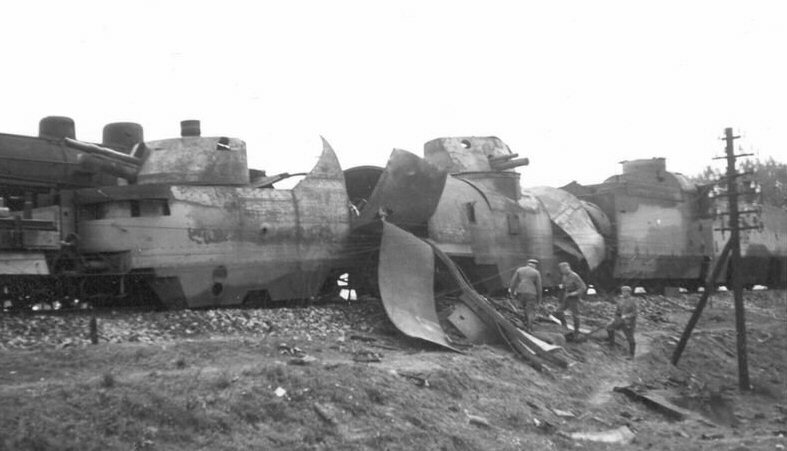 There are numerous holes in external armour layer. A 75 mm cannon in higher turret has a barrel withdrawn to extreme rear position (probably due to damage). 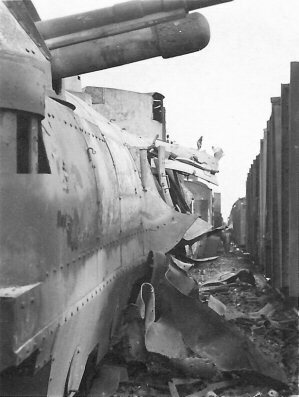 Note a hatch in rear wall of howitzer turret (rarely visible on photographs). Anti-aircraft MG turret is upon the roof. A view from a side. A view towards the train's rear. The assault wagon had two drum machine gun mountings in each side as well (one of them is visible). As above. 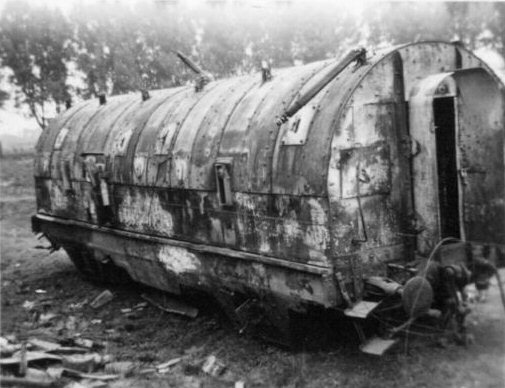 The assault wagon has open side doors and a door in end wall, between wagons. Similar scene. 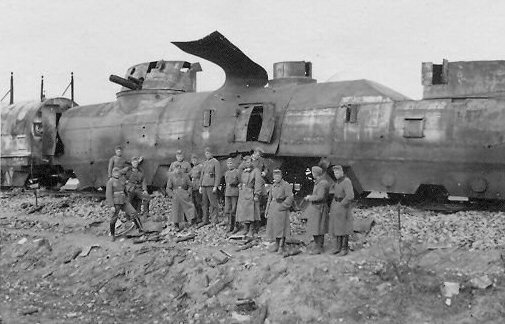 The assault wagon had World War One German trench armoured shields with loop holes in its upper part, clearly outstanding due to burnt-out paint. A view towards the train's front – gently rounded end wall of artillery wagon is visible, with drum machine gun mounting in it. 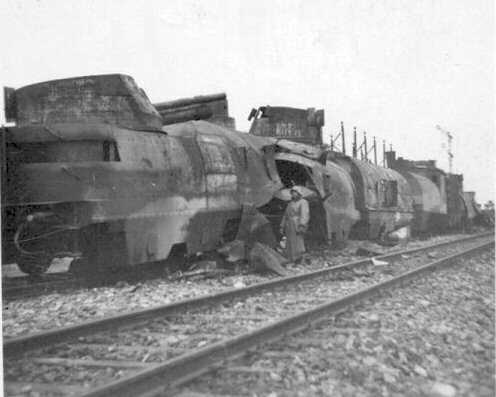 There are additional tool boxes under a chassis of rear flatcar. 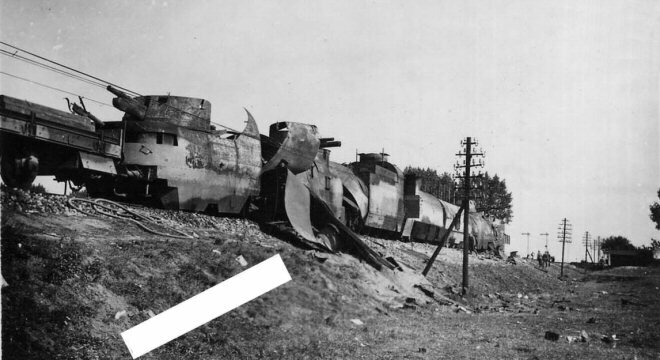 Well visible are details of clothesline antenna above the assault wagon – outward mast on closer side has been apparently broken and hangs on antenna wire. A similar scene from later date (the flatcar and wagons on further track have been removed, as well as the antenna wire). 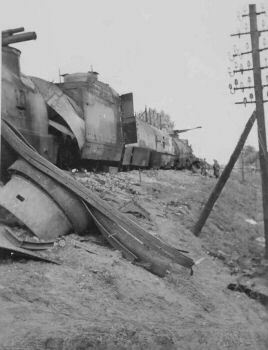 On end wall of the assault wagon there is a hinged plate covering a passage between wagons – useless between the wagon and the locomotive. 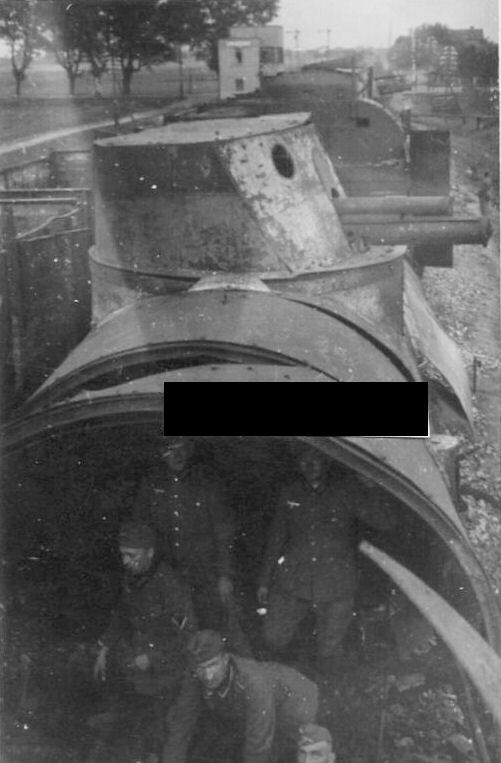 A view on the locomotive towards front. 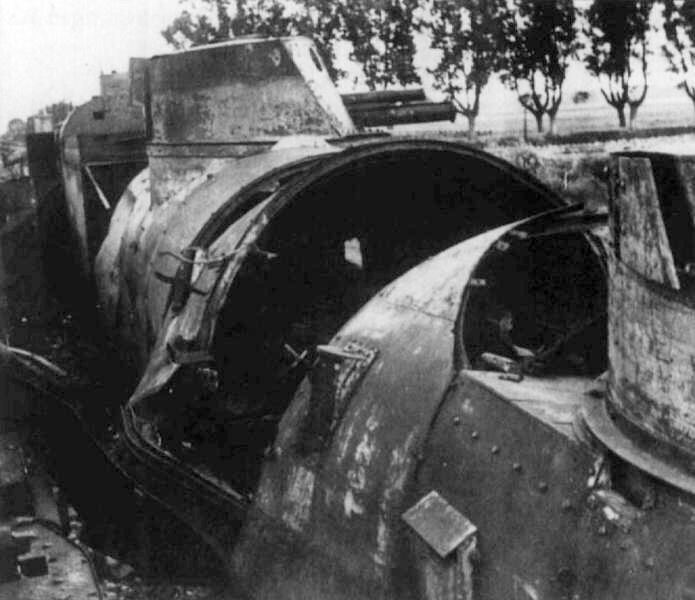 The commander's turret has open hatch. 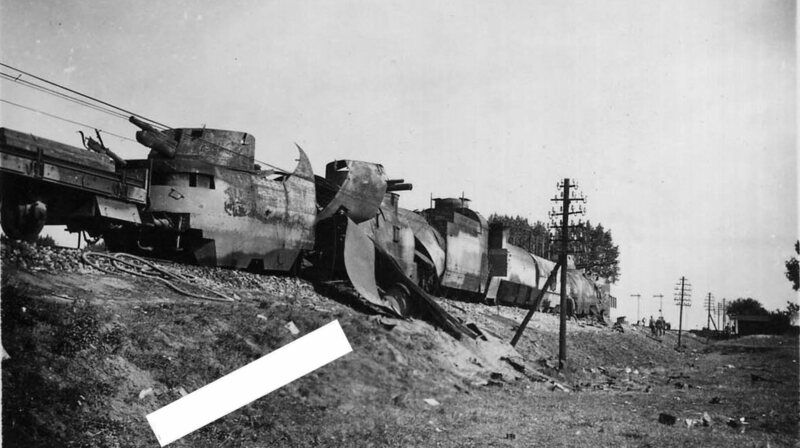 There are two masts behind the turret, for short-range radio wire antenna to communicate with the draisines. 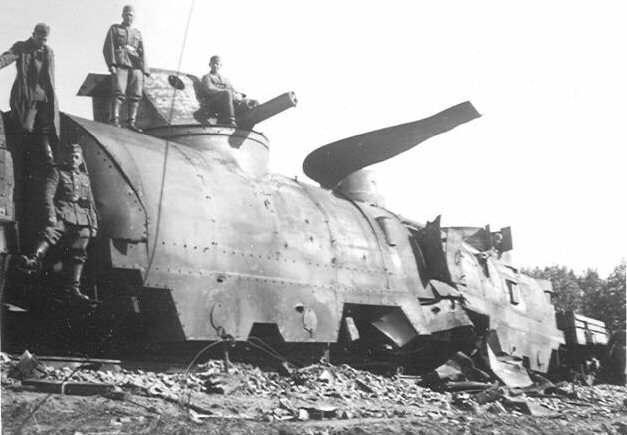 Small hatch in side boiler armour was for air compressor. 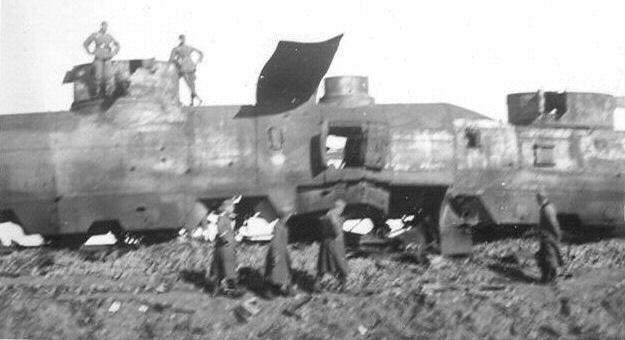 Partially obscured, but very interesting early photograph showing not burned assault wagon and not blown up leading artillery wagon, in spite of destroyed rear wagon. 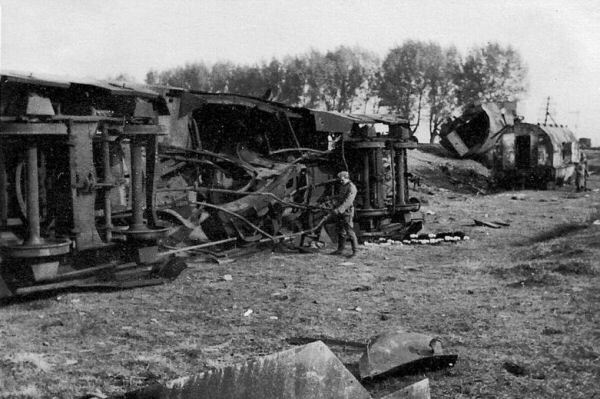 It would mean, that these wagons must have been destroyed by the Germans, in unknown (and illogical) purpose, or by accident... 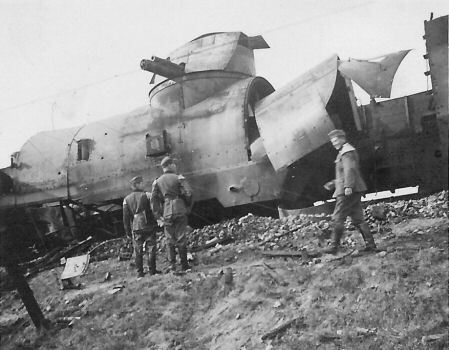 Delayed explosions caused by the Polish seem unlikely. There exist only few such photograps. It has not been covered in sources so far, and according to our knowledge, these photographs were first interpreted in 2019 by us. Moving farther towards the train's rear. There seems an organized excursion. As a sidenote, photographs of German soldiers with such stacked rifles seem quite rare. There are Ti3-16 series plates on the locomotive, and apparently a place after Polish Eagle plate. 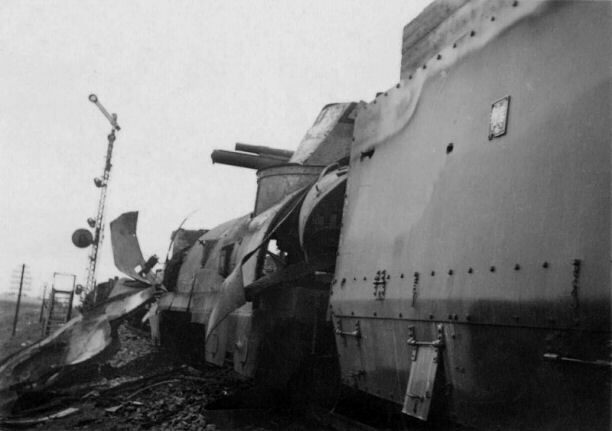 Well visible are two-part doors to locomotive cab. 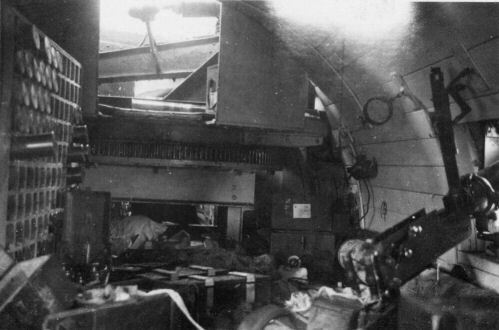 From the cab there was an access to commander's turret above a tender. 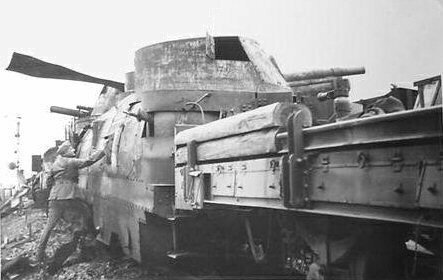 Side window is covered with armoured plate. As above – internal surface of the doors is visible, with securing chain with a spring. The tender with bullet holes and a plate with the coat of arms. There are chains to support open hatches for wheels' greasing. 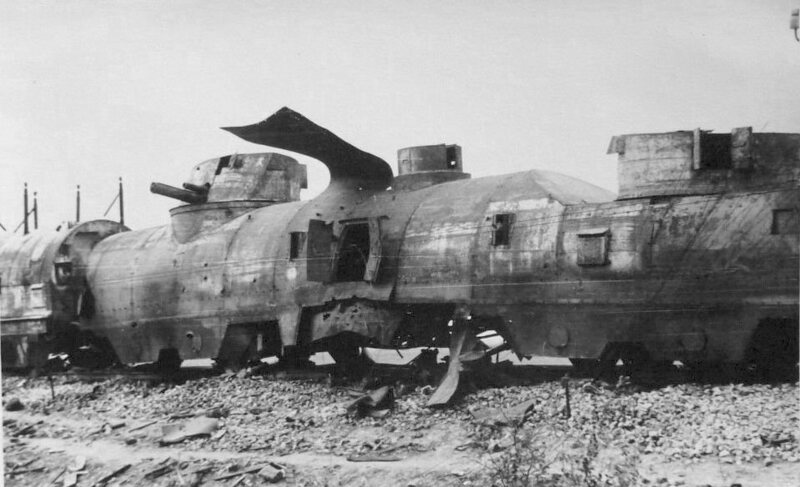 Rear artillery wagon, with 75 mm cannon turret. 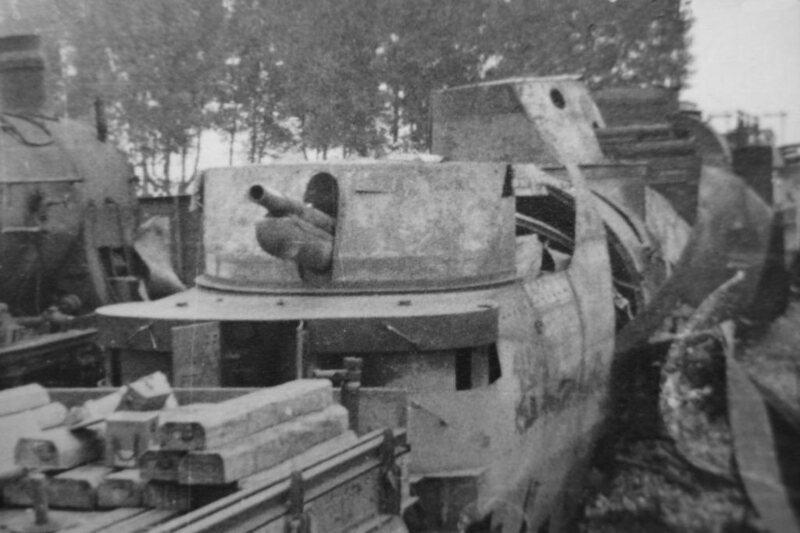 On the right photo, a sprocket wheel of turret's turning mechanism is visible inside. 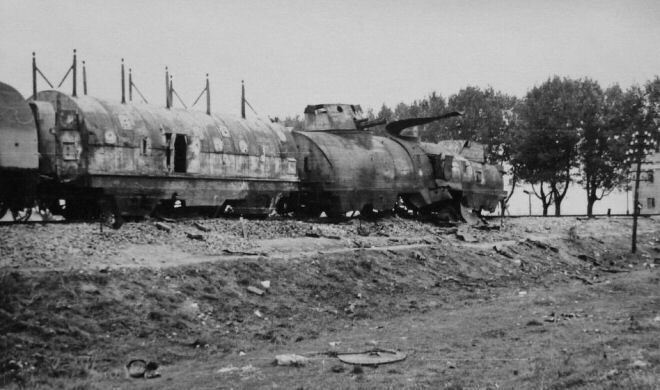 A side view on rear artillery wagon. 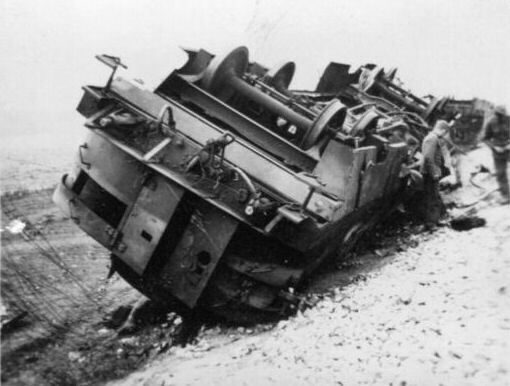 Rear artillery wagon. 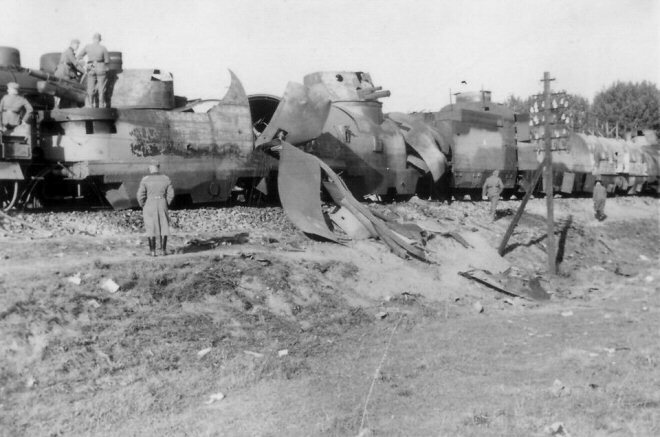 Internal explosion destroyed whole middle part – a two-layer armour structure of Polish-built wagons is visible. Between split layers of armour there is drum machine gun mounting. Fire marks are also visible. As above. 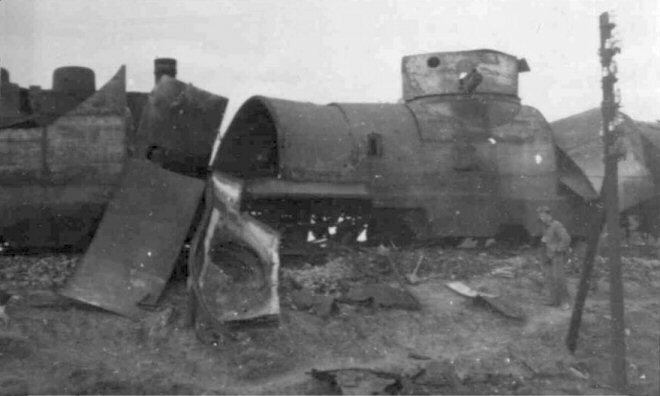 An armour belt with AAMG turret, torn off from the roof, lays on a ground. Wider view. 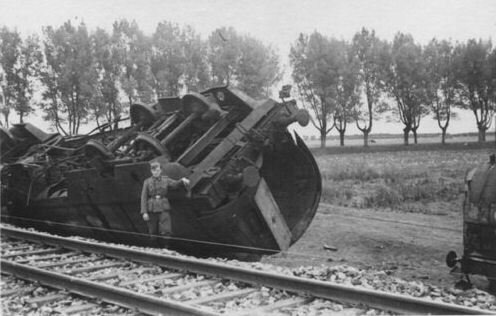 A toolbox under a chassis of the modified flatcar is visible. 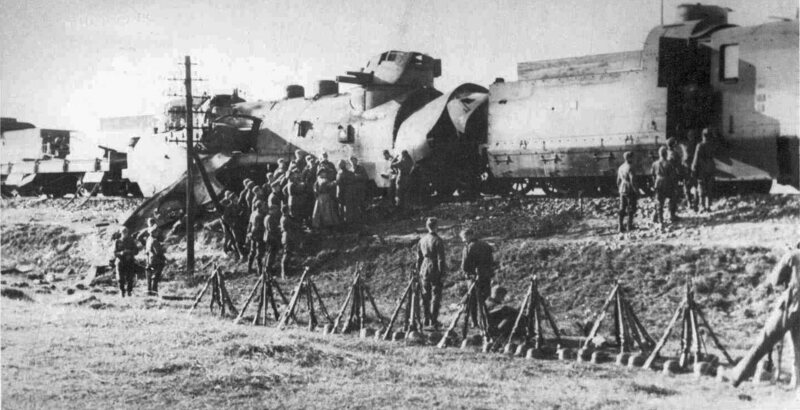 There seems to be 7.92 mm wz.30 HMG (Browning) carried upon the flatcar (not being the train's armament). Similar scene. 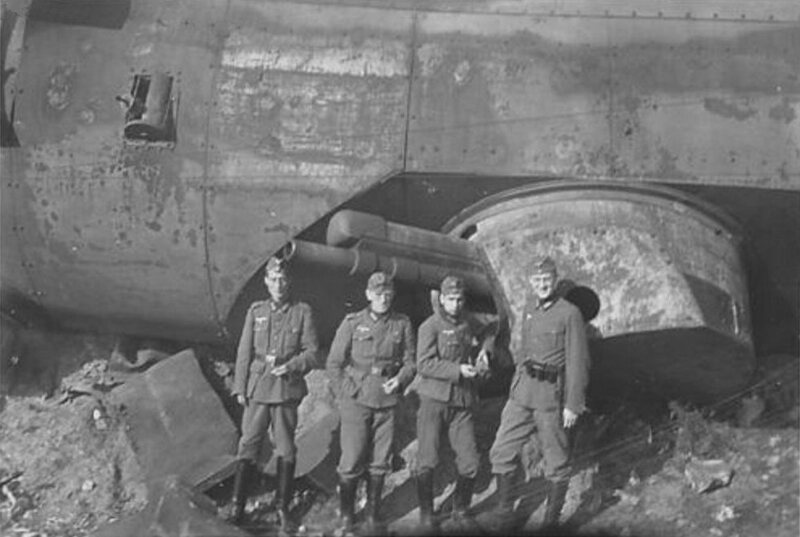 There is wz.08 HMG in corner casemate, removed on other photos. Front view. A 100 mm howitzer is visible. 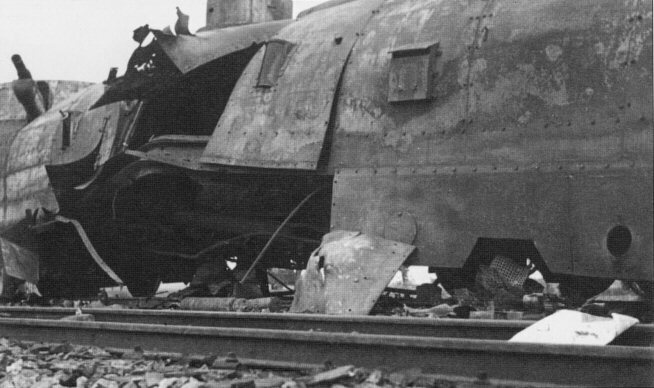 ← Well visible hatch in lower front end of the wagon, and sleepers on the flatcar. ← Only few risked to get inside to obtain an impressive photo to send home... In a background there is rear wall of command compartment visible, with an observation slot. Rear view. 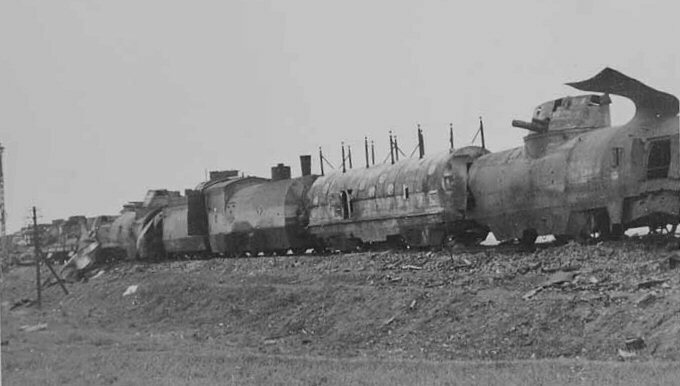 There is a hand pump on the flatcar (not being the train's regular equipment). 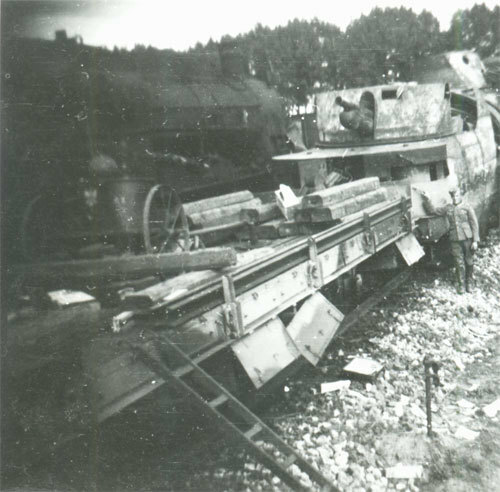 Rear flatcar, partially unloaded. 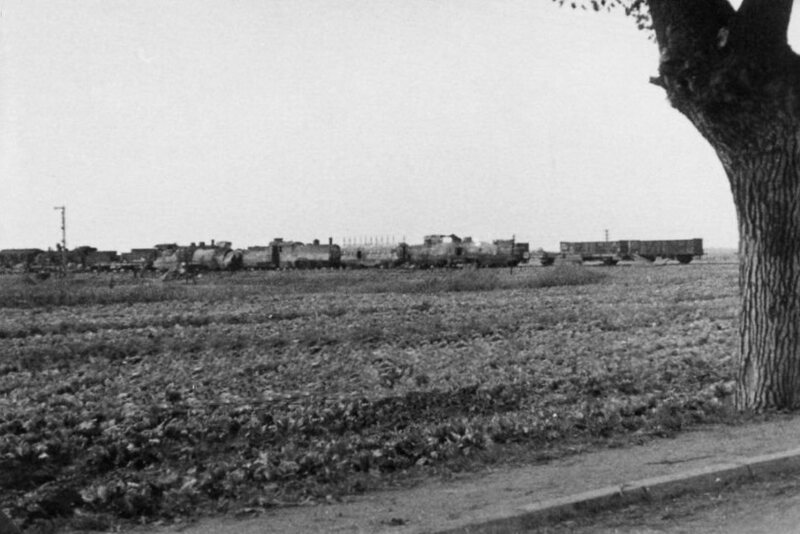 There is a signal box in Płochocin visible on the left (not existing currently), and a crossroad, marked by trees. Views of the train from left side, usually obscured by other stock. 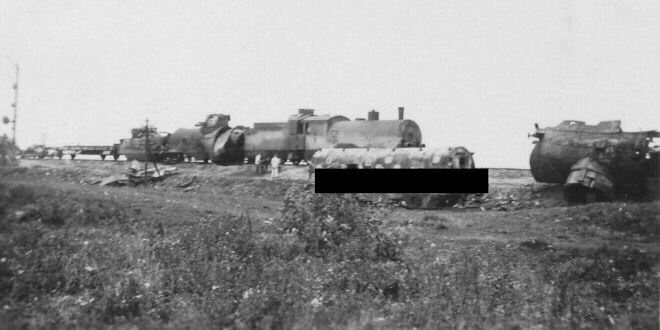 On the left, interesting early photograph, clearly showing relatively intact leading artillery wagon and assault wagon, mentioned before. There are no fire marks on them either. Note, that the assault wagon still has all antenna masts, and 75 mm cannon barrel in higher turret is in normal position. 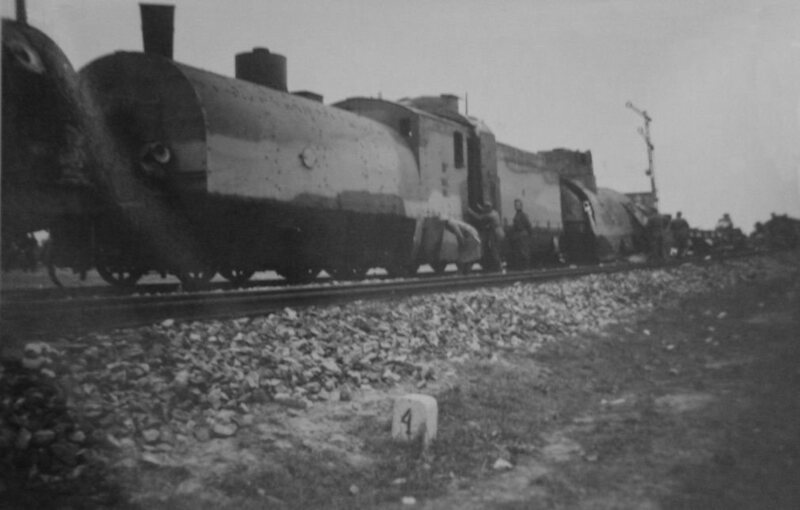 Since it is early photograph, it is enigmatic, why closer track is not jammed. As far as it is known, this photograph was first interpreted in 2019 on our page. 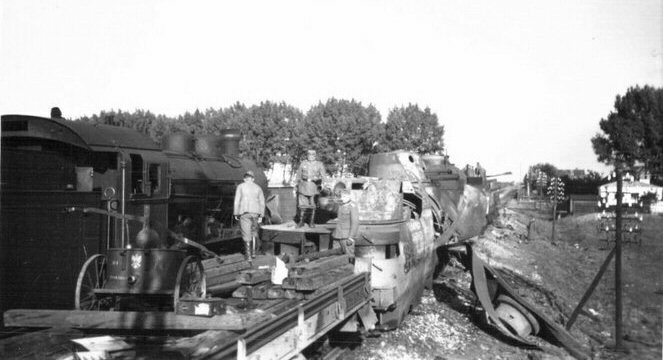 Photographs showing already blown-up and burnt leading artillery wagon. As above. 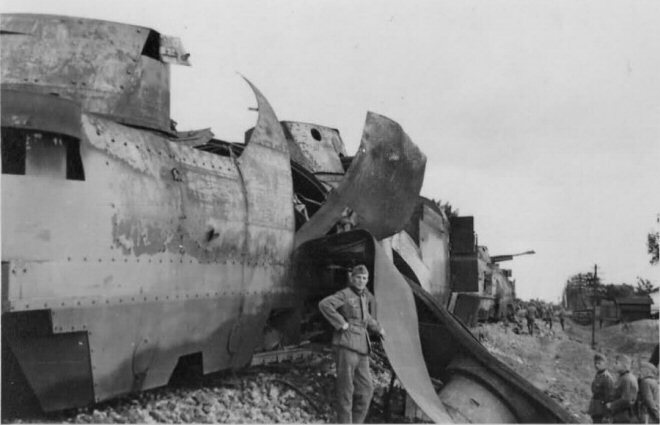 External layer of armour in a middle was blown off and bent to other side, while internal layer remained. A close-up. A base for a plate with the coat of arms is visible. 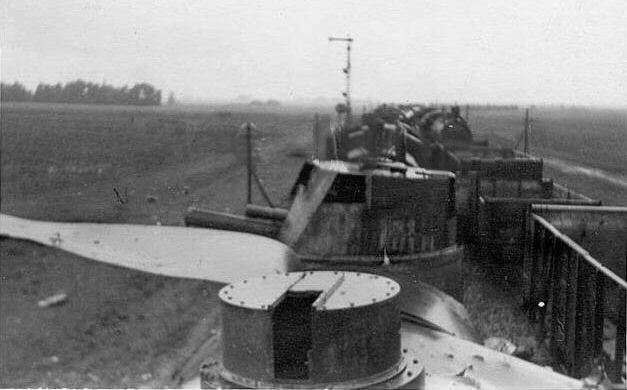 A view from the lower turret of the leading wagon, towards the rear, with well visible AAMG turret. 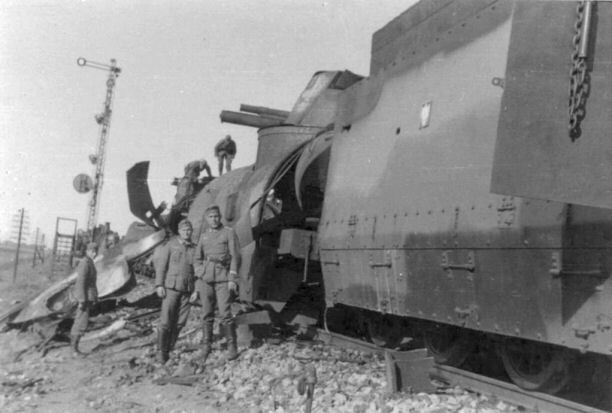 Ti3-16 locomotive from left side. 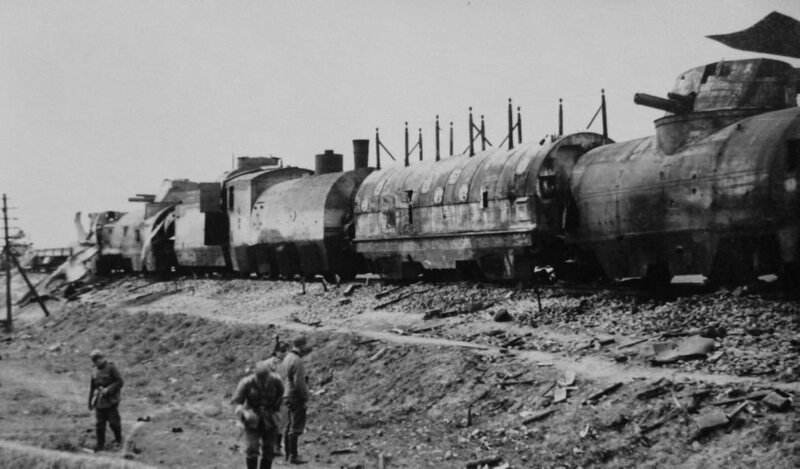 Moving farther to rear artillery wagon. 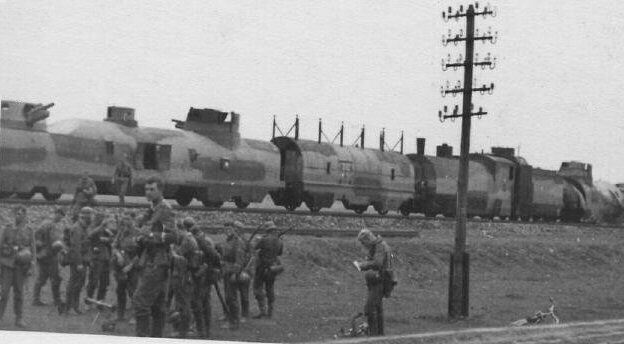 There are R (FT) armoured draisines in a background (more on separate page). A view from the rear. 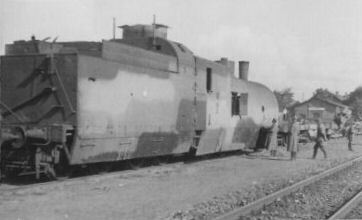 A toolbox under modified flatcar chassis and additional lockers are well visible. A close-up towards a middle. 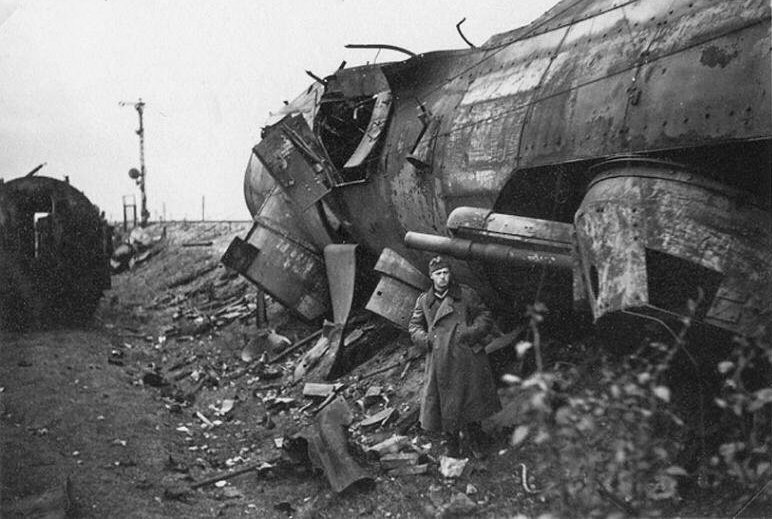 In a background there is rear wall of command compartment visible, with an observation slot. 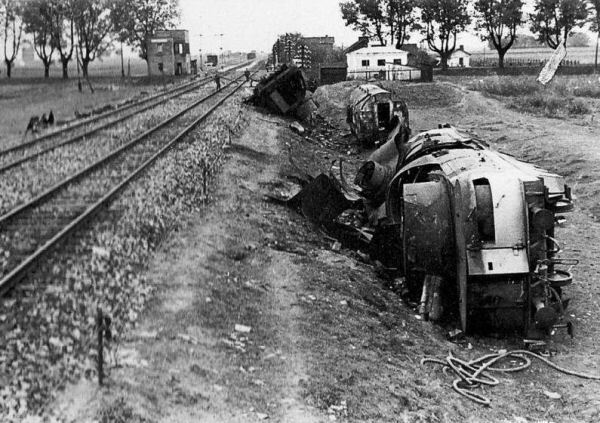 Irreparable wagons were later thrown off of the track. 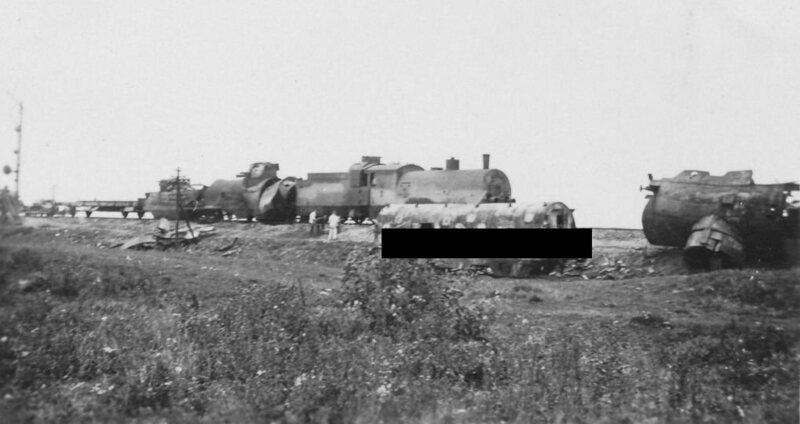 Partly obscured, but interesting photograph with rear artillery car still on the track. ...but soon it will be hauled away. 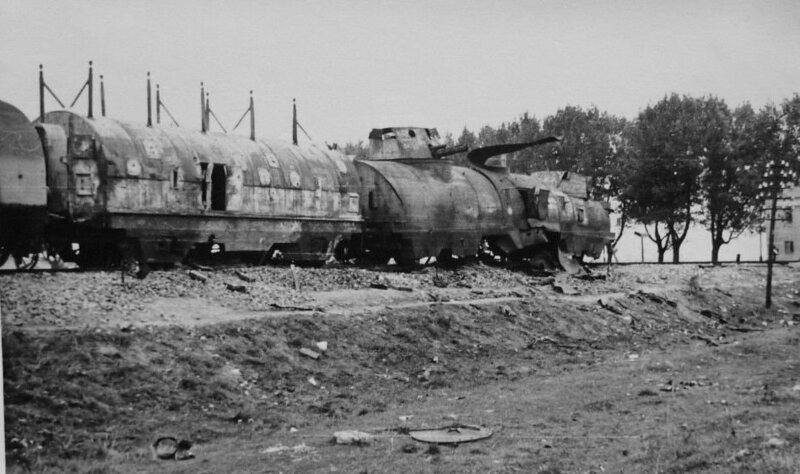 The draisines are still visible in a background. 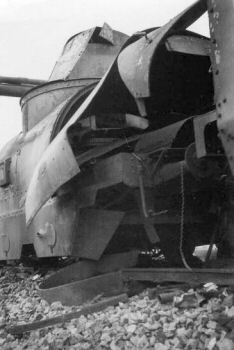 A close-up of leading wagon. As above. Roof profile above MG casemates draws attention. 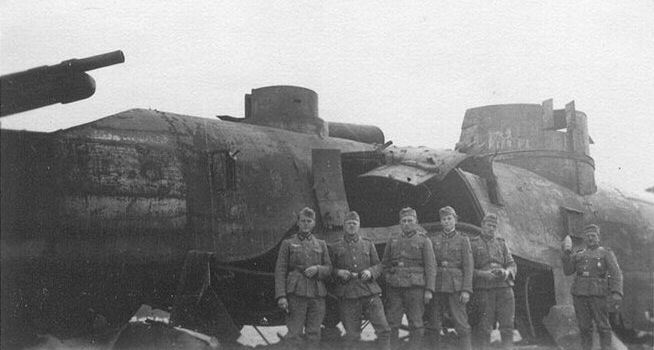 Leading artillery wagon from higher end wall, with doors visible. ...and from lower end wall. The wagon lost buffers. 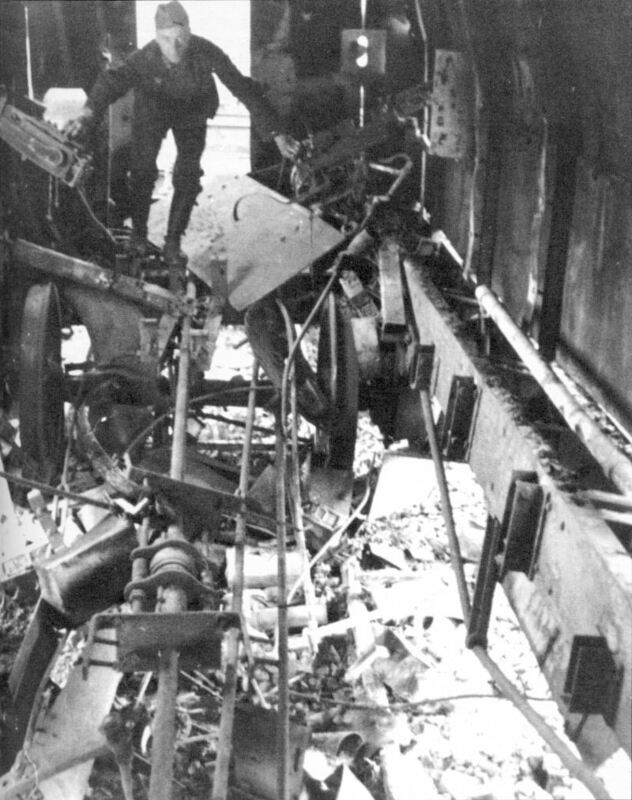 Burnt out assault wagon from outside and inside. 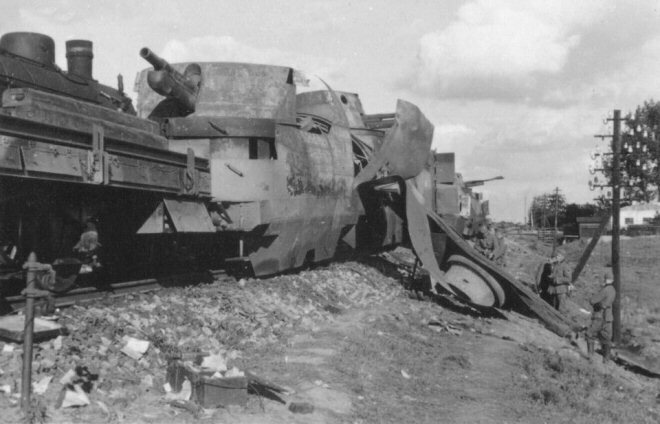 Astonishing is, that the wagon lost armoured floor and its crossmembers somehow... Two machine guns are still mounted. 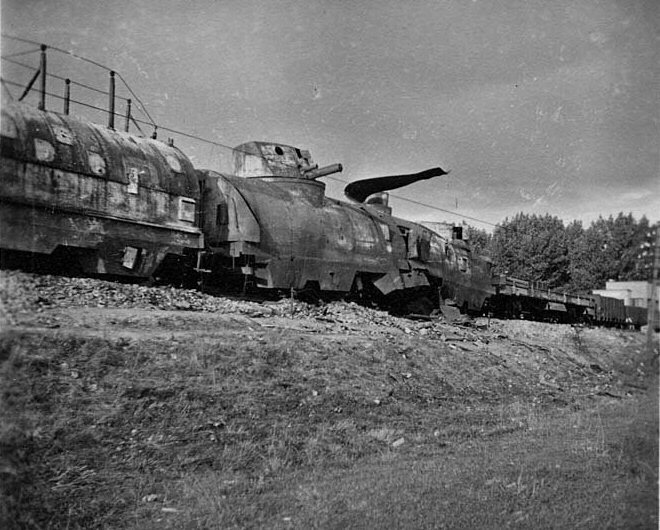 An epilogue – Ti3-16 locomotive with flatcars on a station in nearby Ożarów Mazowiecki was all, that was left from the "Poznańczyk". 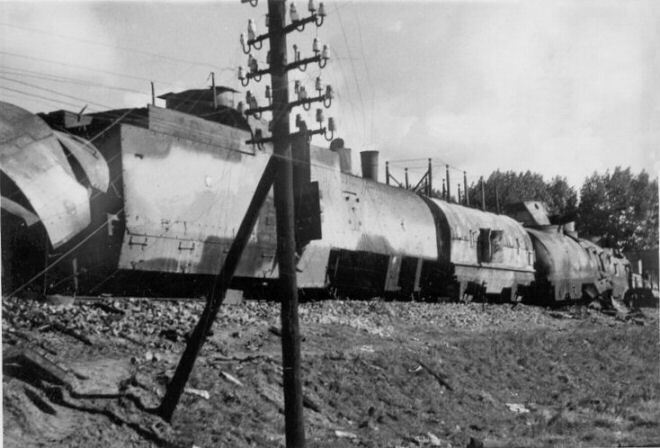 Reportedly it was later used by Wehrmacht as ordinary locomotive, without DRG number, but details are not known. Text and arrangement copyright to Michal Derela.